Update: current audio files can be found on my podcast Kinsella on Liberty, starting at #153. These heartfelt and spontaneous comments reminded me a bit of times past, when students would applaud at the end of a good lecture by a professor. In this sense, and contrary to what you might expect with the coarsening of manners and the increase of informality in typical Internet fora, for some reason the new, high-tech environment created by Mises Academy seems to foster a return to Old World manners and civility — which is very Misesian indeed! Perhaps it is because these students are all 100 percent voluntary, and they want to learn. They are much like students decades ago, who were grateful to get into college — before state subsidies of education and the entitlement mentality set in, turning universities into playgrounds for spoiled children who often skip the classes, paid for 10 percent by parents and 90 percent by the taxpayer. 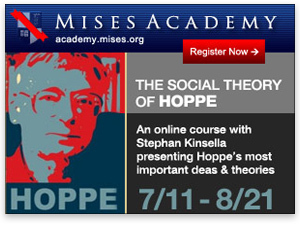 The audio and slides for all six lectures of the Social Theory of Hoppe course are provided below. The “suggested readings” for each lecture are appended to the end of this post.